Two weeks ago, my sister sent me some Maybelline Eye Studio Color Tattoo Eyeshadows, but I wanted to test them out and make sure they lived up to their "24hr" claim (which they didn't) before posting anything on them. From left to right: Fierce & Tangy, Bold Gold, Bad to the Bronze, Tough as Taupe, Pomegranate Punk, Audacious Asphalt. Fierce & Tangy: An electrified carrot juice orange. Bold Gold: A shimmery medium-toned yellow-gold. Bad to the Bronze: A metallic taupe-bronze. Tough as Taupe: A cool toned matte wet concrete grey with a purple-mauve undertone. Pomegranate Punk: A Shimmery brown based plummy-pomegranate-burgundy. Audacious Asphalt: A shimmery bluish-gunmetal grey with a slight greenish tinge. 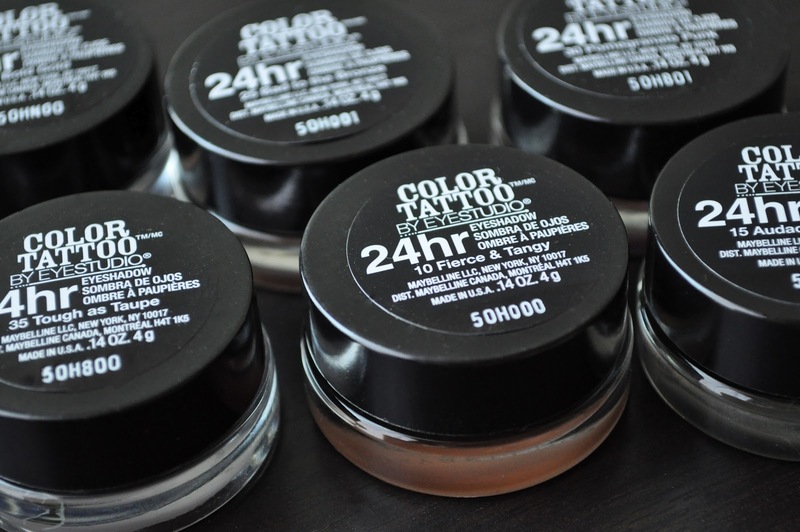 I get about 9 hours of wear with the Maybelline Eye Studio Color Tattoo Eyeshadows...and for reference, I don't have oily eyelids- my skin type is normal to dry. 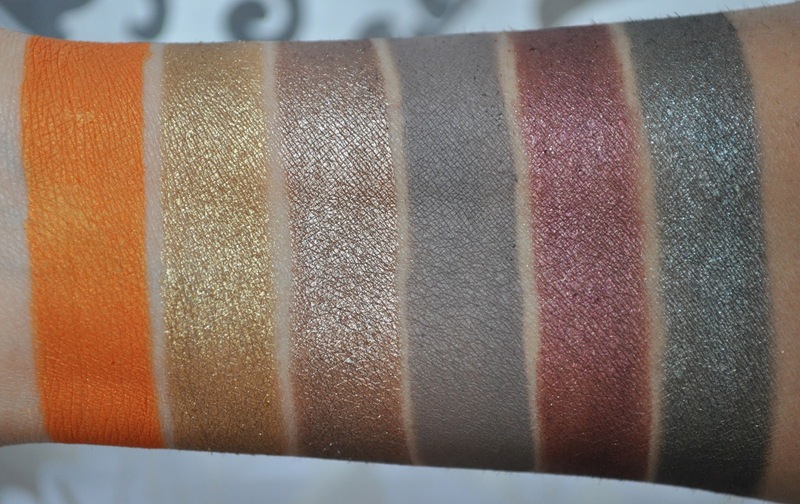 I really enjoy Maybelline's Eye Studio Color Tattoo Eyeshadows; they work well as a base or worn alone, as a wash of color on the lid. They blend easily, don't crease or fade (for at least 9 hours anyway), are perfect for summer, since that's when I tend to swatch to cream eyeshadows and blushes. Maybelline Eye Studio Color Tattoo Eyeshadows retail for $6.99 each. But, I believe my sister purchased these eyeshadows during a "buy one get one 50% off" promotion. 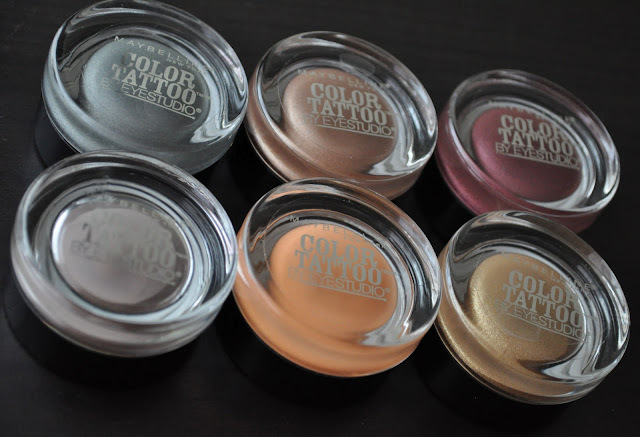 Have you tired the Maybelline Eye Studio Color Tattoo Eyeshadows? If so, What's your favorite shadow? I know what you mean, we don't have these in Japan either. And when we finally get them, they'll probably be ridiculously priced. I haven't tried them. I like the 2nd, 3rd, 5th and 6th from the left. Currently, I've been loving the 1st, 3rd, 5th and 6th. When will they release these here? I can't wait! And your swatches are not helping my patience! LOL! Fierce and Tangy looks so amazing! Hahaha, sorry about that :P Fierce and tangy looks amazing on the eyes! I've even used it on my cheeks and it looks great. beautiful colors, i would love to try bright yellow.. wonder how it would look one me..
Hey Beautiful! How much are these in the UK? Yes, you definitely need Bad to the Bronze, it's a winner!! and you're right Tough as Taupe is a tricky color to work with, since it can look a bit too cool and look unflattering on certain skin tones. What shade of foundation do you wear again (i.e. mac, dior, chanel, etc)? OMG! I am soo obsessed with them and I'm looking to try the tough as taupe and bold gold! Maybe audacious asphalt too! :) I have pomegranate punk and bad to the bronze!